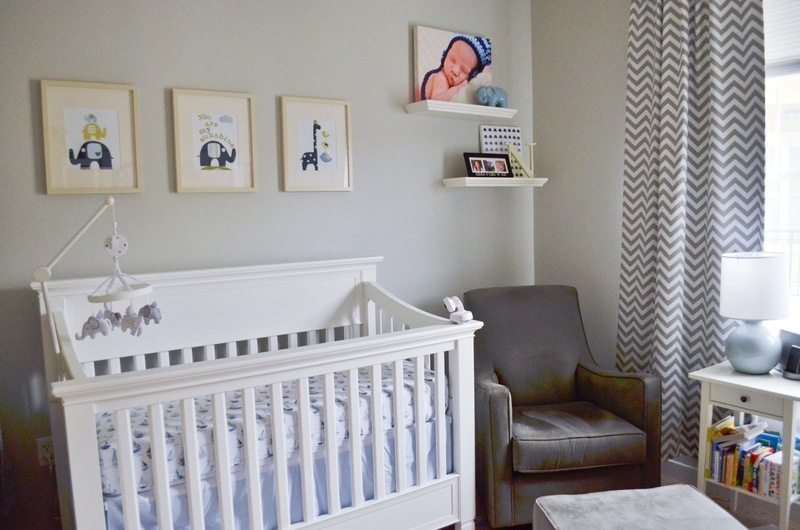 I can't believe it took me over 5 months after Noah was born to finally take pictures of his nursery! As soon as we found out we were pregnant, I started thinking about the nursery. Once we knew he was going to be a boy, I started picking out all the gender specific accessories. I knew I didn't want something that screamed BOY and that was more neutral. I also knew that there was going to be a lot of elephants! I decided gray would be a nice neutral color for the walls, and then we would add in different shades of blue and a little bit of green in the decor. The glider was one of the first things we got for the room. I knew I didn't want the typical glider, so I searched online for a while before finding this one at the Land of Nod. I knew I liked the look, but I wanted to test it out in person to make sure it would be comfortable during those middle of the night feedings. 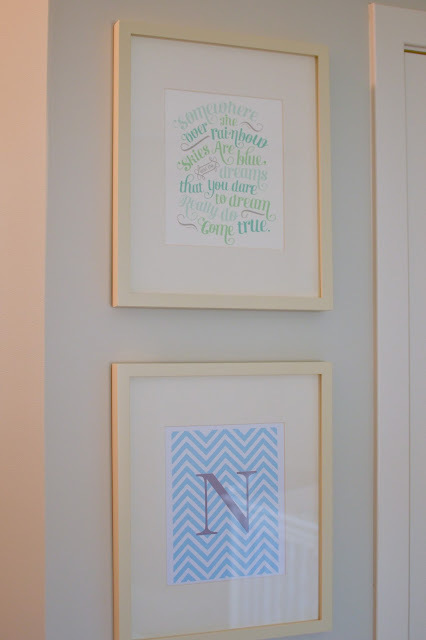 Since there isn't a Land of Nod store near us, we started doing some research. Chris found out that this small children's store, Giggle, carried the glider and they had a store in NYC. We made the trip one day, and I'm so glad we did... the glider was so comfortable and right then I knew this was our glider. We got a coupon for Land of Nod, purchased the glider, and arranged for delivery on the very day we were moving into our new apartment. The curtains were the next thing I ordered. 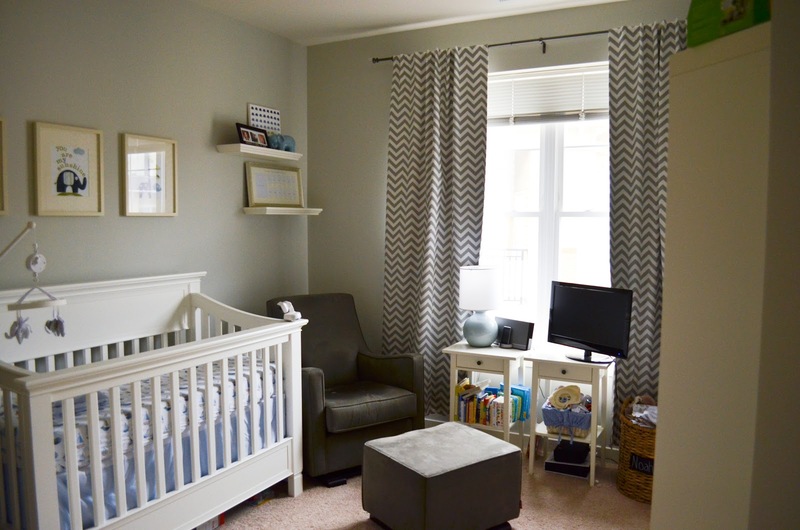 I love the chevron print and figured that the gray and white was gender neutral. 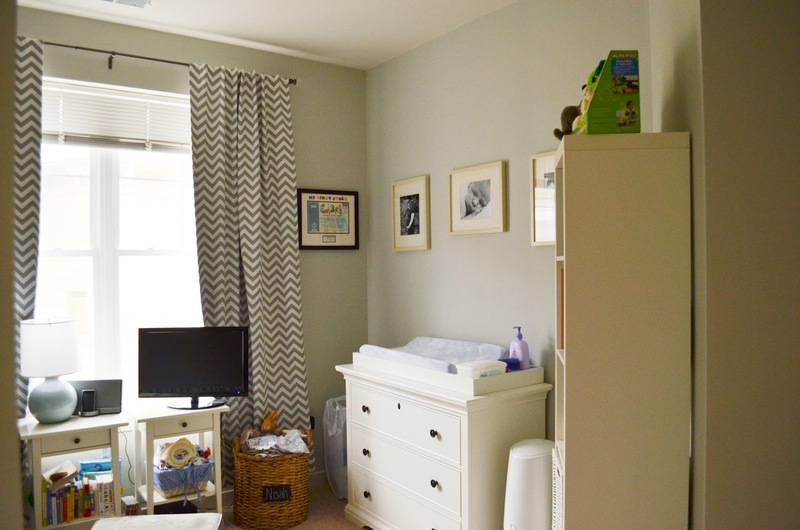 I definitely splurged on the curtains, but I plan to use them for a very long time, whether it be in a nursery, a child's room, or even our master bedroom (if Noah, or a possible future child, gets sick of them). 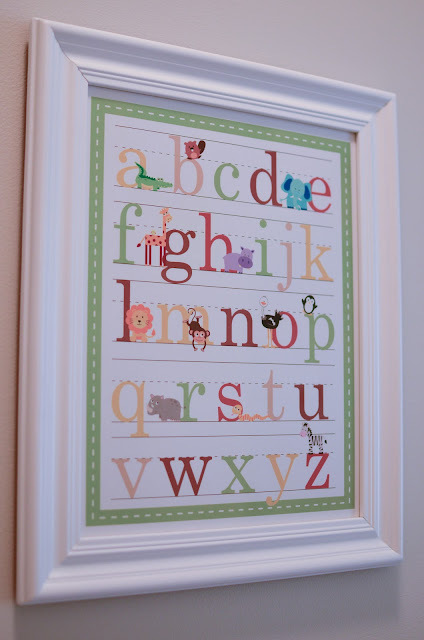 With all the big purchases we made, I wanted to make sure that they would work in a little girl's nursery, if we ever end up having a baby girl in the future. Therefore, I designed the room with neutral furniture and used artwork, bedding, and accessories to bring color into the room. 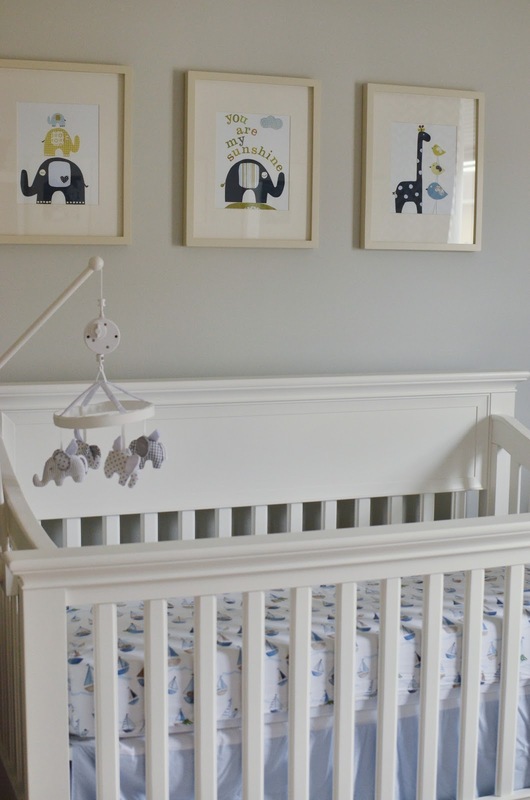 I always knew that I wanted a Pottery Barn crib regardless of the gender. My parents generously offered to buy Baby Flinn's crib and changing table. I immediately loved the classic look of the Larkin Crib and Changing Table! 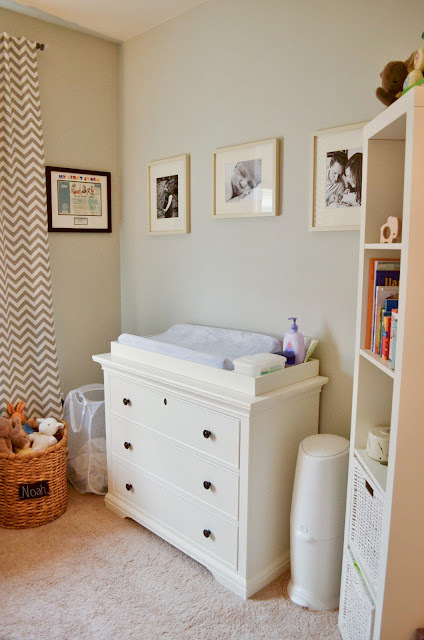 The crib was delivered shortly after we moved in, but the changing table was seriously backordered and we didn't get it until after Noah was born! Apparently it was because the "topper" was backordered and they had to ship them together... pretty annoying if you ask me! We got some drawer organizers from Ikea for the changing table. I LOVE THEM! 4 fit in each drawer and keep all his little clothes so organized. In the top drawer we keep diapers, undershirts, and socks. 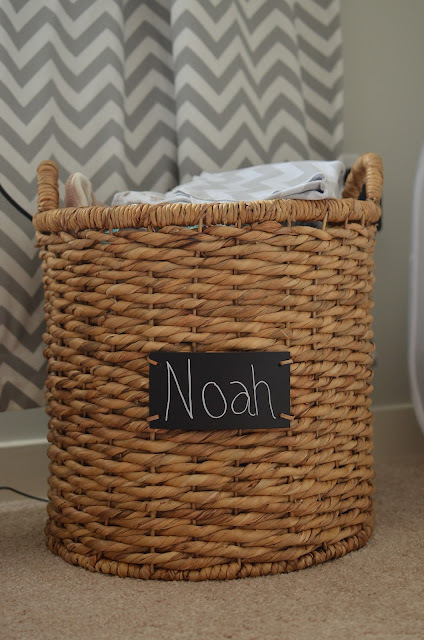 The baskets are the perfect size for all his little clothes! We got our bedding from Pottery Barn Kids and I loved the elephants (and other animals) in the sail boats. 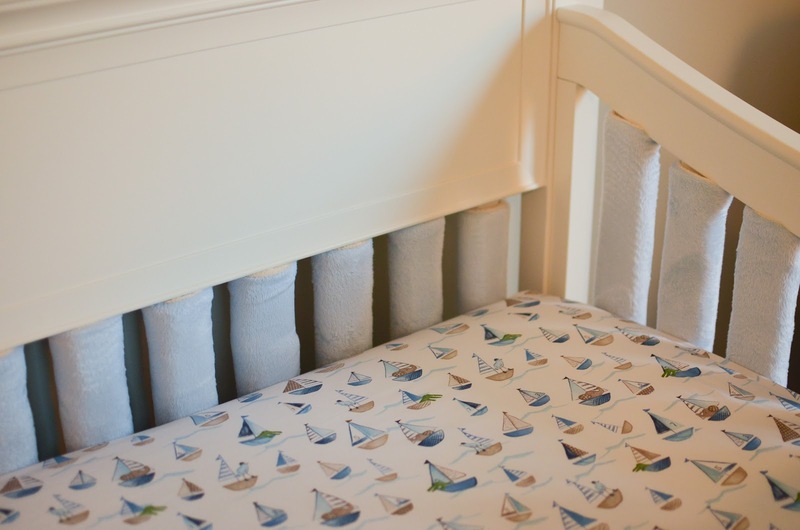 Just recently we added these vertical bumpers to his crib. The main reason we wanted bumpers was because Noah keeps turning himself at night and then bangs his head against the rails. We knew the traditional bumpers aren't really safe, but the mesh bumpers don't add the cushion that we were looking for. That's when I found these! They don't restrict airflow and they provide a soft cushion for when he bangs his head into the rails. The great thing is that they are reversible to cream, so if we end up having a girl next time, we can still use them without screaming BOY! As for the details... We got a lot of the artwork for Noah's room from Etsy. I got all the white frames from Pottery Barn so that everything matched. 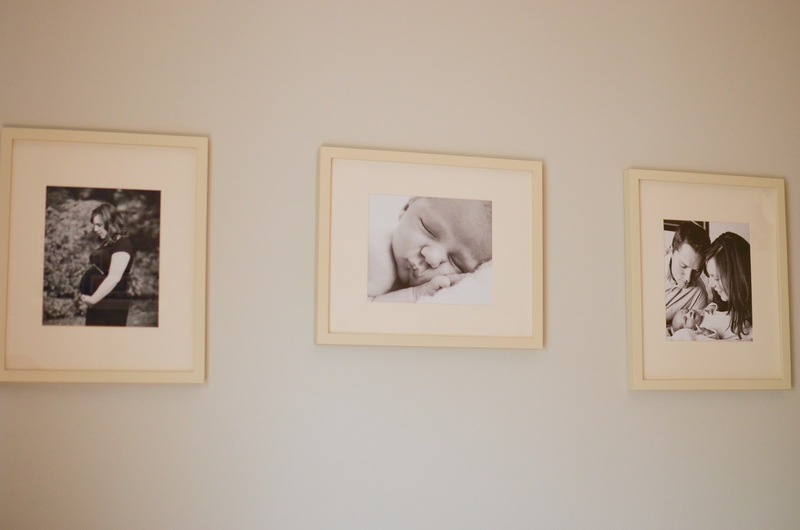 I also really wanted to put black and white photos of us above his changing table. We hung one from our maternity photo shoot, one of Noah by himself, and one of our new family. I absolutely love how they look there! 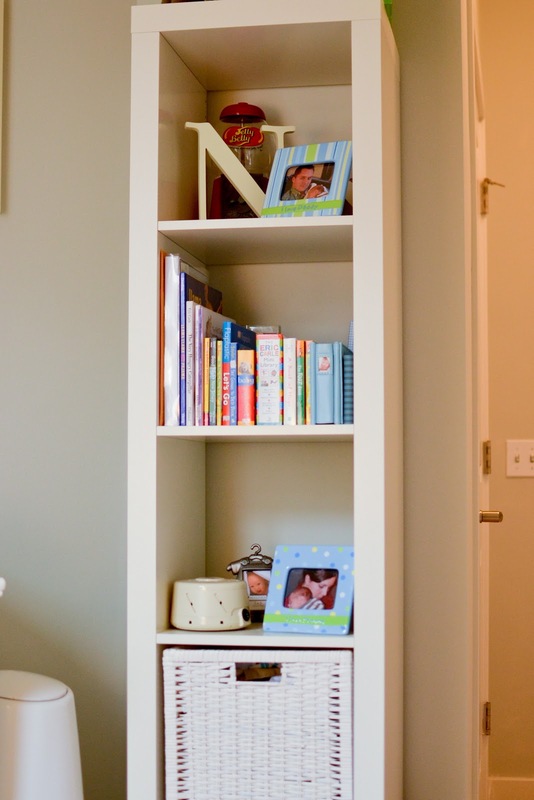 We got the bookcase from Ikea. It's the very popular Expedit and we got the 4 opening square one for his closet. I love the combination of display shelves as well as room for the baskets. We store extra blankets, sheets, bigger size clothes, and toys in them. 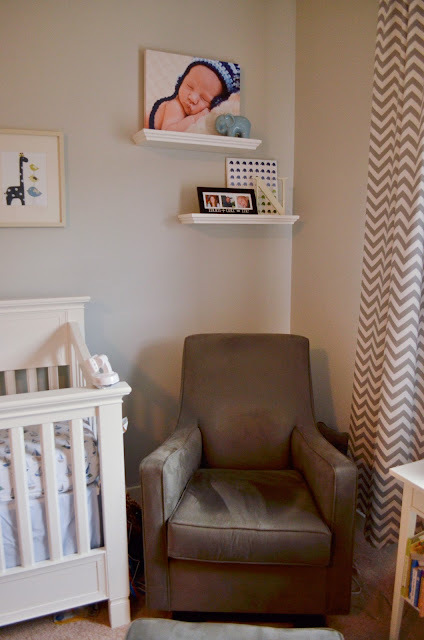 I have changed around these shelves quite a few times since Noah was born (as you can see through the pictures), and that's one of the things I love about them! I appreciate the flexibility the shelves offer and how I can change up the vibe whenever I want. The bottom frame is a personalized monthly frame from Pottery Barn, and I am currently waiting for his month 1-5 pictures from Persnickety Prints. 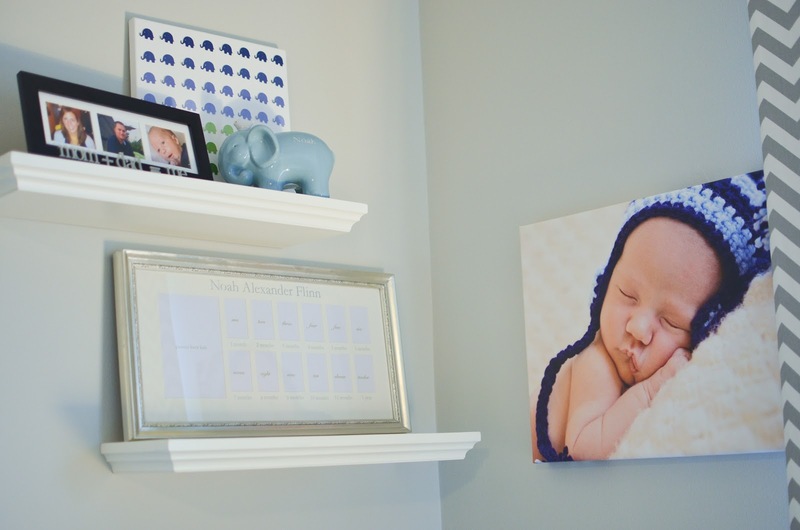 The canvas is one of Noah's newborn pictures and was the picture we had used for his announcement... it's one of my favorite pictures! I had seen this basket from Target on Jessica and Natasha's blogs and absolutely loved it. I love the chalkboard label on it and that it could fit so many things in it. We currently store his stuffed animals in it as well as some burp cloths. 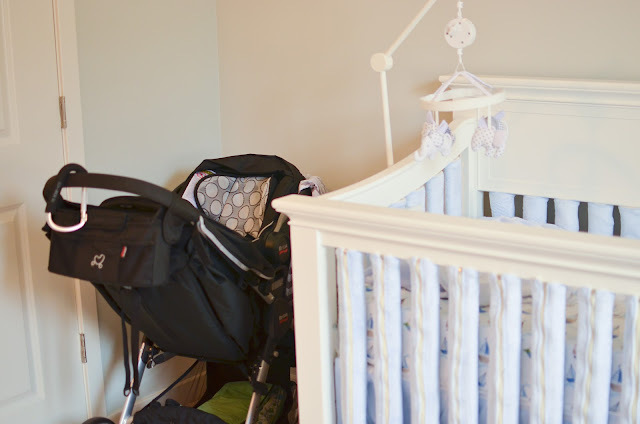 Now for full disclosure... we keep our stroller in his nursery. We live in an apartment, so we don't have a garage or "mud room" to leave the stroller when we come in. Thankfully I just happened to leave some space to the left of the crib where the stroller fits perfectly. It's not the most attractive, but it's convenient and practical. 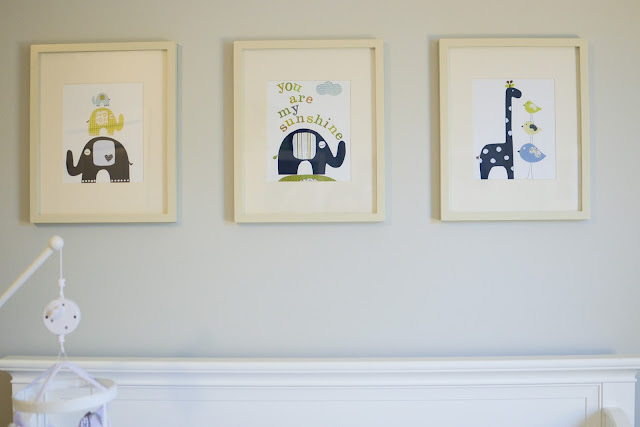 So there you have it... Noah's Nursery! I love how the muted colors really provides a serene and peaceful feeling. It's really nice to be able to glide Noah to sleep each night in here.